Prime Minister Justin Trudeau said his government is fighting some Canadian veterans in court because they are asking for more than the federal government can afford to give. Prime Minister Justin Trudeau said his government is fighting some Canadian veterans in court because they are asking for more than the federal government can afford. "Why are we still fighting certain veterans groups in court? Because they're asking for more than we are able to give right now," Trudeau said, answering a question from a veteran, who said he lost his leg to an improvised explosive device in Afghanistan, during a town hall meeting on Thursday evening in Edmonton. Some people booed that answer, forcing Trudeau to calm the crowd. "You are asking for honest answers," he said to the crowd at MacEwan University Sport and Wellness. "The old Veterans' Charter involved lump-sum payments and very little in the way of services." A veterans' group said earlier this week it is taking its fight over recent changes to the pension system to the Supreme Court of Canada. Another veteran said that he did not think Trudeau was really listening to veterans and that his government's restoration of the lifelong pension was a "lacklustre" effort at best. Before the old lifetime pension was eliminated in favour of a lump sum payment, veterans could have received up to $2,700 per month for pain and suffering. Under the restored pension plan the Liberal government introduced, the maximum a wounded soldier would ever see is $1,150 per month. "I have pledged, and I did pledge and I will continue to pledge that I will do right by you," Trudeau said. "The changes that we've made to our support for veterans are based around recognizing where we went wrong before." Trudeau said his government's monthly pension amount is lower because it takes into account the cost of services offered by the federal government, including post-traumatic-stress treatment and psychological care, support for caregivers and family members who look after wounded veterans and job training for those who can still get back into the job market. One questioner asked why the federal government was continuing its "witch hunt" against Vice-Admiral Mark Norman, who is alleged to have leaked cabinet secrets to an executive at Chantier-Davie, a shipbuilding company based in Levis, Que. Trudeau said that the issue of leaking cabinet secrets was a rare one, and without referring specifically to Norman's case, said it had to be taken seriously. "Secrecy of confidential processes, of bidding of procurement in government is extremely important. There are often millions and billions of dollars at stake and cabinet secrecy and confidentiality is not something we can ever take lightly." Speaking about Norman directly, Trudeau said that he would not say much about specifics, except to note that he took the advice of the chief of defence staff. "I trust our public service, in their capacity to make determinations about what actually need to happen in cases like this, and I don't think that political interference in the rigorous decision-making process that went [into] choosing to moving on a case like this would have made anything better in this particular case." 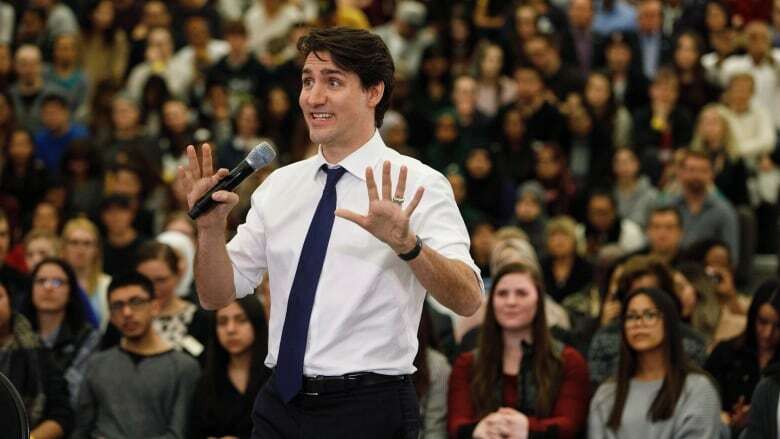 Trudeau's town hall tour has already seen him host events in the Halifax suburb of Lower Sackville, N.S., as well as London, Ont., Hamilton, Quebec City and Winnipeg. Nearly all the events so far have seen a mix of enthusiastic audience members keen to exchange with the prime minister and hecklers trying to shout Trudeau down when answering questions. The prime minister will host his last event in Nanaimo, B.C., on Friday. The federal government's changes to the pension system introduce a patchwork allowing veterans to take either a lump sum or a lifetime pension, which would deliver a maximum tax-free payment of $1,150 per month. The Liberals also are introducing another tax-free pain and suffering award on top of the existing one - either a lump sum or pension that would give wounded veterans up to $1,500 per month, depending on their level of disability. This story has been updated from an earlier version to include more information on pending changes to veterans' pensions.